Do we have to believe that we’re bad to the bone? The third in the latest “Take and Read” series — a book analysis, discussion, and dessert group led by Paul Doerksen of MBCI — happens this evening and the book we’ll be talking about is Original Sin: A Cultural History by Alan Jacobs, professor of English at Wheaton College in Illinois. 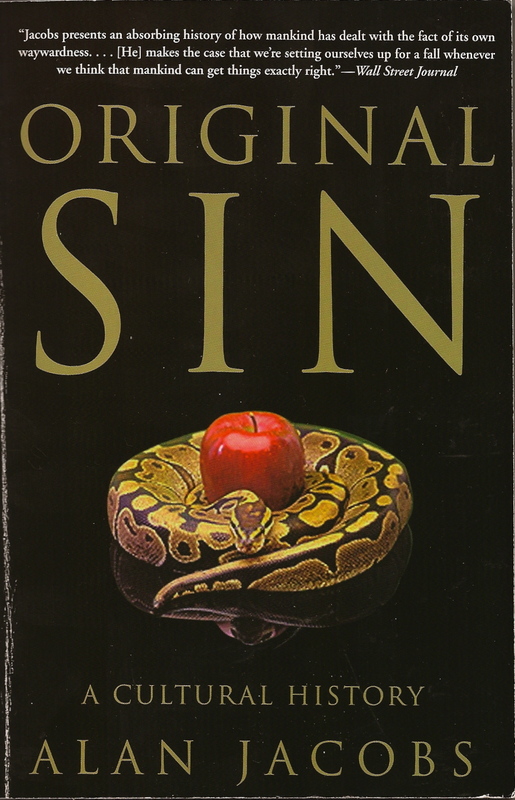 Jacobs’ book is not a theological study of original sin (by which is meant “sin that’s already inside us, already dwelling in us at our origin, at our very conception”), but rather, as the subtitle suggests, the story of how this doctrine has worked itself out through (Western) history. Nor is the fact that humans do wrong under debate. That seems obvious enough. Anyone with self-awareness or knowledge of others, or with even a rudimentary sense of the 20th century knows how unloving and selfish, how truly cruel, we human beings can be. Jacobs proceeds to show how belief or disbelief in original sin played out in many cultural epochs and forms. He’s an excellent storyteller. His tour takes us to Augustine, who articulated what he saw as the teaching of Paul into the doctrine of original sin (including the inferences that only baptism could remove its “damning stain” and its further “logic” that those who die without baptism are eternally damned, as well as the belief that original sin’s mark is most primarily found in our uncontrollable sexual desires) and defended it against Pelagius, who emphasized our “perfectly free will.” It takes us to John Milton, John Bunyan, and Jean-Jacques Rousseau, to Jonathan Edwards, Charles Finney, Rebecca West, and Solzhenitsyn. It takes a look at that great experiment in “starting over” called America and its system of slavery, and at Marian devotion. Jacobs also wants us to grasp the “democracy” inherent in the doctrine of original sin. If each of us stands judged alike as a sinner because of adamic inheritance, then class or racial distinctions with their oft-given labels of noble or despicable simply crumble. This entry was posted in Books and tagged Alan Jacobs, GAMEO, original sin, Paul Doerksen, Take and Read by doradueck. Bookmark the permalink. Karr is one of the few contemporary writers who takes up where Flannery O’Conner left off with human nature. But she is also gentle with herself and others in a way that Puritans, for example, were not. Perhaps there is a Catholic view that is more democratic and more forgiving than the Calvinist view?? For me, the biggest problem with universally inherited adamic sin (or at least some portrayals of it) is the picture of God it paints. To put it bluntly, it’s hard to figure out how a good and just God can punish an entire species based on the sin of our progenitor(s). Just this morning I was watching a popular American pastor angrily denouncing those who did not think correctly about the nature and severity of God’s wrath against human sinfulness. Yet this same pastor has repeatedly and vehemently argued that we are born into sinfulness and depravity through no choice of our own. I have had numerous conversations with skeptics or even just curious people who think this is a head-scratcher to put it mildly, morally abhorrent to put it more strongly. Nonetheless, as you say above, the universality of human sinfulness has never lacked empirical corroboration! Maybe the early Anabaptists were onto something in staying outside these controversies. We have meaningful freedom. Divine grace is real and efficacious. And we live in the tension between these two. “Does our Christian faith really require us to believe that all of us are bad to the bone?” I’m not sure it does. I think our Christian faith requires us to acknowledge that we are creatures who sin and to seek forgiveness for this; but it also requires us to proudly and joyfully proclaim that we are creatures upon whom God has stamped his image and given the privilege of reflecting that image throughout the world. Both are true and both need to be emphasized. I love the quote from Bill Watterson at the end. Referring to the character of Calvin standing for a bleak view of human nature, he says this: “I wouldn’t want Calvin in my house, but on paper, he helps me sort through my life and understand it. I just finished this book last year and thoroughly enjoyed it. Like you, I found Jacobs to be an excellent story teller. Regarding your question of whether we’re born bad to the bone: I wonder how we would communicate the idea of total depravity to a small child. I have two girls who are old enough to know who God is, but I’ve often wondered how they would react if I suggest to them that they were born wicked. I have no doubt of the reality of universal human sin (and Jacobs book is a great reminder). Nor do I doubt our need of salvation from that sin. But I think we are simultaneously perpetrators and victims when it comes to sin – and God’s salvation is big enough for both. Shirley, Ryan, Gil: I find myself moved and grateful this morning, considering all of your comments. They’ve become true “bones” for me around this subject (to reference the name of this blog), forming new connections and understandings individually, but also in the way they relate to one another. Thanks so much! @ Ryan: I resonate with your response and also your wrap-up, eloquently put, that what’s required is to know ourselves — and you say “proclaim” — as creatures who sin and as creatures upon whom God has stamped his image. Holding both at once. — And thanks for the most appropriate link to Calvin and Hobbes, which also references the Alan Jacobs book. I couldn’t help thinking back to the years our kids were teens. We had a bookshelf above the the table in the kitchen, full of recipe books but also reading-while-you’re-eating-alone material. Usually it was the collected volumes of Calvin and Hobbes (and later Foxtrot) that came down, and I’d hear the chuckling along with the huge bowls of cereal being consumed as a snack. I assumed it was for pleasure, but maybe what we’d failed to convey as parents on the weighty matters of original sin and human nature was going down true and easy and with a laugh, thanks to Watterson! @ Gil: Which leads into your question of communicating such concepts to your daughters. As you suggest, it’s in the education of our children — and the approaches seem to swing trendily between the poles of this debate from one generation to the next — that this question becomes so critical and practical. — “Simultaneously perpetrators and victims.” In the piece about Karr mentioned above, she speaks of how parents pass on their follies, “flaws too deep for fathoming,” and she meant by their example and in the relationship as much as via some “at conception” original condition, I think. So we may communicate wickedness more than we wish, but grace too. I hope(d) for that at least.